The latest instalment of Documents on Irish Foreign Policy, covering 1957-1961, has just been published. 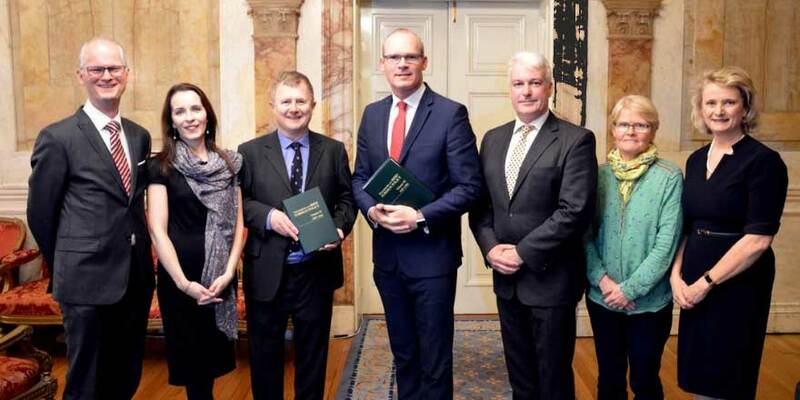 The eleventh instalment of Documents on Irish Foreign Policy, covering the period 1957 to 1961, was launched on 13 November by An Tánaiste, Simon Coveney TD in Iveagh House. It covers the period when Éamon de Valera stepped down as Taoiseach, to be replaced by Seán Lemass. This was at the height of the Cold War, when, despite Ireland’s neutrality, the Department of External Affairs (as it was then called) prepared for Ireland actually being involved in a potential third world war (these preparations included plans to arm Irish diplomats in danger zones in case of public unrest). In the late fifties and early sixties the Department also had to grapple with legacies of the Second World War, such as whether the former Nazi paratroop commander Otto Skorzeny (best known for rescuing the Italian fascist leader Benito Mussolini) should be given an Irish residence permit. Here Minister for External Affairs Frank Aiken prevailed over the Department of Justice, and Skorzeny never received authorisation to reside permanently in Ireland. The years from 1957 to 1961 also marked the heyday of Ireland’s activism at the United Nations, with Ireland playing a central role on issues ranging from nuclear disarmament to apartheid to the discussion of the admission of Communist China. The volume includes documents on the ‘China vote’, nuclear non-proliferation, and an account of Frederick Boland, whilst President of the UN General Assembly, breaking his gavel whilst trying to call Soviet leader Nikita Khrushchev to order. Significantly, the volume also covers the years in which Irish Defence Forces personnel first participated in peacekeeping missions with the United Nations in Africa and the Middle East. These include proof that the UN approved Conor Cruise O’Brien’s taking the organisation to war in Congo’s Katanga province and documents on the Niemba Ambush (November 1960), and the fighting at Jadotville and Elisabethville (September 1961). A constant theme through the volume is Ireland’s desire to become involved in European integration, a policy vigorously pursued by Lemass. The volume includes the high-level diplomacy surrounding Ireland first application for membership of the European Economic Community in 1961, with some striking parallels to Brexit – striking in that the parallels with Brexit are clear, except that the question asked is ‘What if Ireland is out and Britain is in?’  There’s mention of a border down the Irish Sea, the status of Northern Ireland, that separate trade agreements between North and South and Ireland and the UK are possible, and that London thought little about Ireland (north and south) in undertaking entry to the EEC. Alongside such key topics are documents dealing with a wide range of others: the prospect of the deposed Cuban dictator Fulgencio Batista taking refuge in Ireland, overseas adoptions of Irish children, Irish diplomats’ views on the election of John F. Kennedy, the Cold War context of Irish-Soviet (non)-relations, Frank Aiken’s distrust of public opinion in foreign policymaking, the Irish embassy in London’s views on race relations in Britain, Ireland’s first diplomatic moves in Africa, and links between the Defence Forces G2 and MI6 and the CIA. Using original declassified documents from the Department of Foreign Affairs and Trade‘s archive, the volume pieces together as no other source can, the top-level decision making by Minister for External Affairs Frank Aiken, Taoiseach Seán Lemass and Irish diplomats such as Frederick Boland and Conor Cruise O’Brien that saw Ireland come to play a central role on the world stage. Documents on Irish Foreign Policy Volume XI, 1957-61 is available to buy now. Image: L-R Prof. M. Peter Kennedy (President, RIA), Dr Kate O’Malley (Assistant Editor, DIFP), Prof. Eunan O’Halpin MRIA, An Tánaiste, Simon Coveney TD, Dr Michael Kennedy (Executive Editor, DIFP), Prof. Bernadette Whelan MRIA, Ms Fiona Flood (DFAT).